Our products are the best value on the market, enough so that pre-existing suppliers have been swapping to our range! CBD Edibles (Gummy Sweets), CBD Tinctures (500mg-1500mg), CBD Vape Juices, CBD Vape Cartridges (Perfect for Petrol stations), CBD Bath Bombs, CBD Pet Treats (sprays & tinctures) CBD Pain Relief Creams (Health stores, gyms, Physio), CBD Hand & Body Lotion. Looking for agents to distribute all over the UK and Ireland. 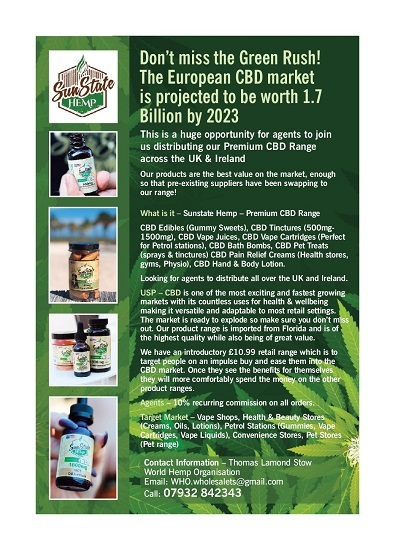 USP – CBD is one of the most exciting and fastest growing markets with its countless uses for health & wellbeing making it versatile and adaptable to most retail settings. The market is ready to explode so make sure you don’t miss out. Our product range is imported from Florida and is of the highest quality while also being of great value. We have an introductory £10.99 retail range which is to target people on an impulse buy and ease them into the CBD market. Once they see the benefits for themselves they will more comfortably spend the money on the other product ranges. Agents – 10% recurring commission on all orders.